Last week we went along with our friend Polly, had the privilege of going with Naturalist Jim Conrad on one of his “Nature Meditation” walks. Every morning Jim leaves his residence at Mayan Beach Garden Inn and walks around, being present in the wonderful part of nature known as the Yucatan. Along the way, he points out and patiently explains many of the fascinating but often overlooked aspects of this areas unique plant, bird, mammal, insect and fish species. Jim conducts these nature walks for free, expecting only that participants will walk away with an increased awareness of the area’s ecosystem and why areas such as the Yucatan should be preserved. Before we got started Jim showed us several Chaya shrubs also known as Spinach Trees growing in flower beds on the grounds of the hotel. Chaya is so rich in protein that in hard times the Mayans used to use it as a meat substitute. It is also very rich in vitamins and antioxidants. The remarkable Chaya was one of the first plants offered by the indigenous populations to arriving Europeans. Also nearby was the medicinal plant spurge. Spurge is a form of castor oil and can be made into a tea that acts as a mild laxative. Just outside the hotel, Jim showed us a beautiful coconut tree. On casual inspection, the tree looks like a typical, tropical coconut. He then pointed out that upon closer inspection the tree is suffering from a disease known as Lethal Yellowing Disease (LYD). LYD is caused by a kind of bacteria known as a phytoplasma which is transported from plant to plant by insects known as planthoppers. In some parts of the Caribbean, this disease has killed up to 90% of the existing coconut palms. One of the reasons LYD is such a great threat to the Yucatan is a manmade lack of species diversity, also known as a monoculture. 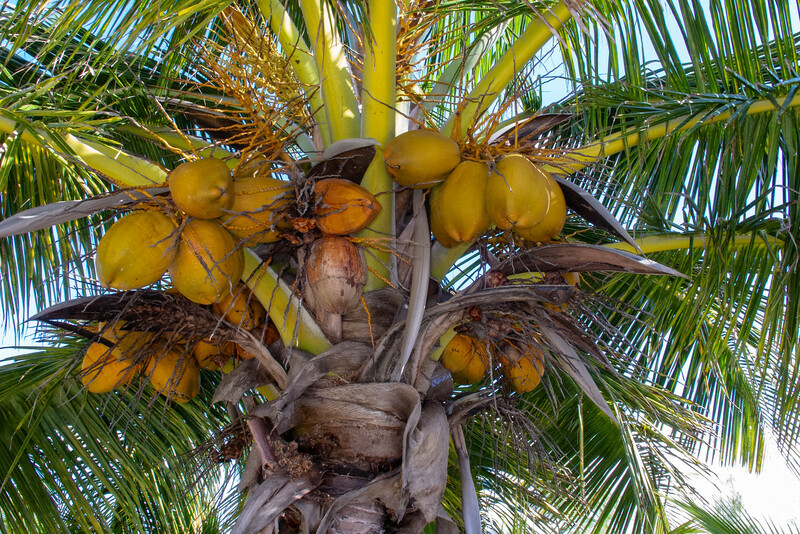 Over the last century many slow-growing native coconut species, which were disease resistant, have been replaced by faster-growing trees in order to maximize coconut yields. Short term, replacing slow growing hearty trees with fast-growing frail ones means more profits. Long-term creating a monoculture means that one disease can wipe out coconut production and kill an industry. What the overall effect will be on the Yucatan is still unknown. This phenomenon is not unique to the Yucatan; increasingly, many of the world’s other food crops are monocultures. Moving down the road we saw a bushy tree with beautiful flowers orange known as a Geiger tree. 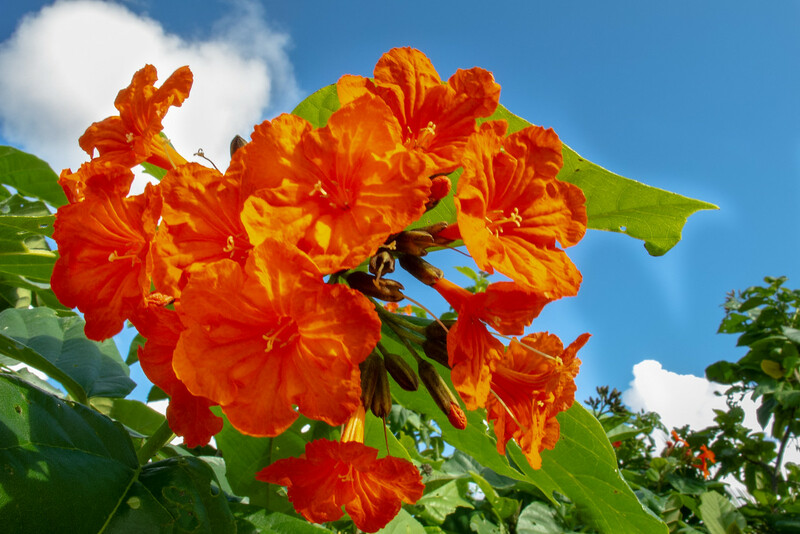 This Yucatan native was known to the Mayans as siricote and is a highly prized ornamental in the United States. The area is thick with these pleasant trees which can sometimes grow to as high as 25′. You may have seen this plant or a close cousin planted as screens along roadsides in tropical areas of Texas, California and Florida. Here in the Yucatan, they grow wild and free. Immediately across the road was a highly invasive plant known as the Australian Pine. This tree is interesting in that it has what appear to be needles but which are in fact tiny multi-joined branches. Brought to the area from Australia for erosion control this fast-growing tree rapidly sends out shallow roots that cover a large area just below the soil making it difficult for native plants to take root. 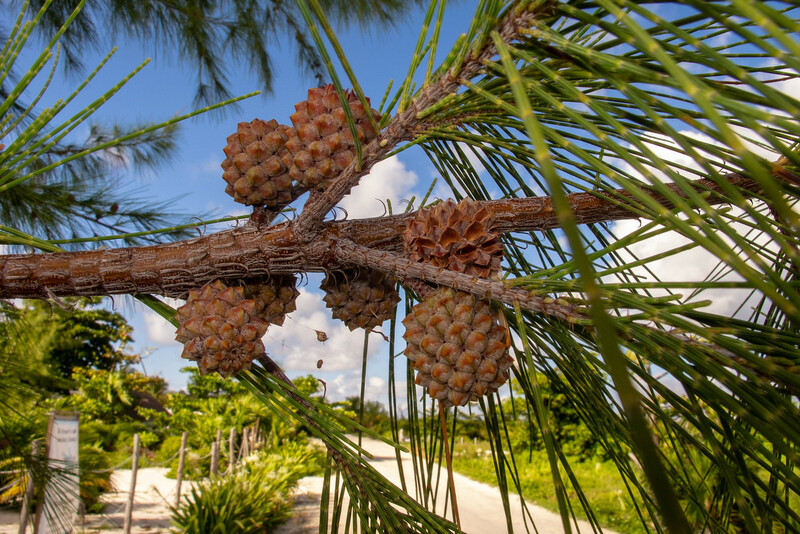 The Australian Pine has been outlawed in Florida and is becoming an attractive nuisance pantropically. 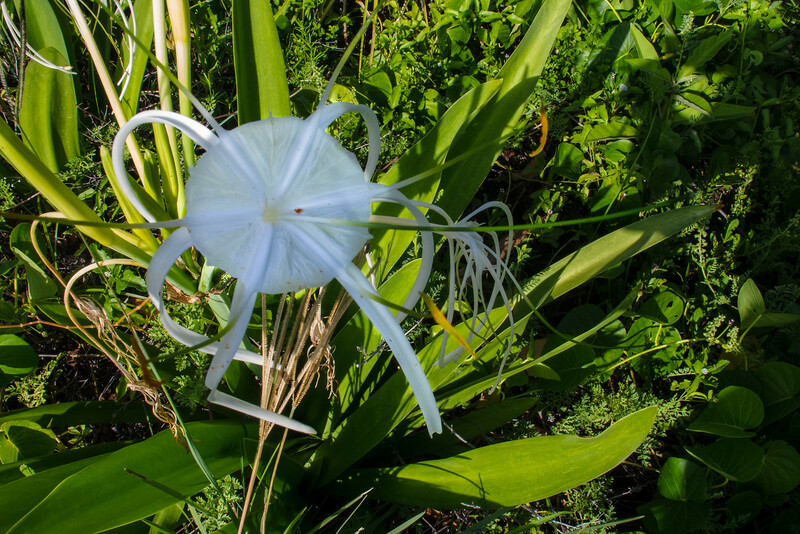 The area is also home to an abundance of another attractive native plant called Hymenocallis Littoralis commonly known as the Beach-Spider Lilly. The Beach-Spider Lilly grows on sandy ridges often quite near the sea. Their reproductive system is fascinating but I won’t go into the details; Jim discusses Hymenocallis Littoralis reproduction in detail here on his website. 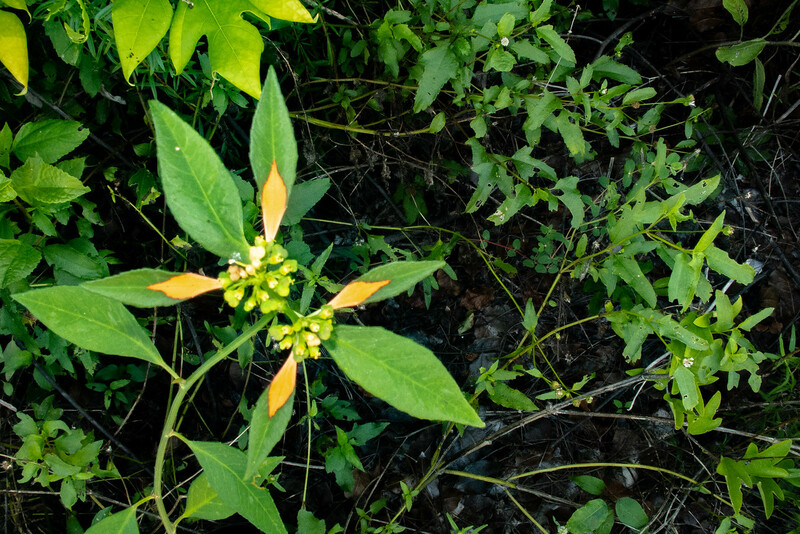 There was Euphorbia Heterophylla, also known as a Wild Poinsettia. This little plant, through just a few centuries of artificial selection, was caused by humans to evolve into what we now know as Euphorbia Pulcherrima or the Christmas Poinsettia. 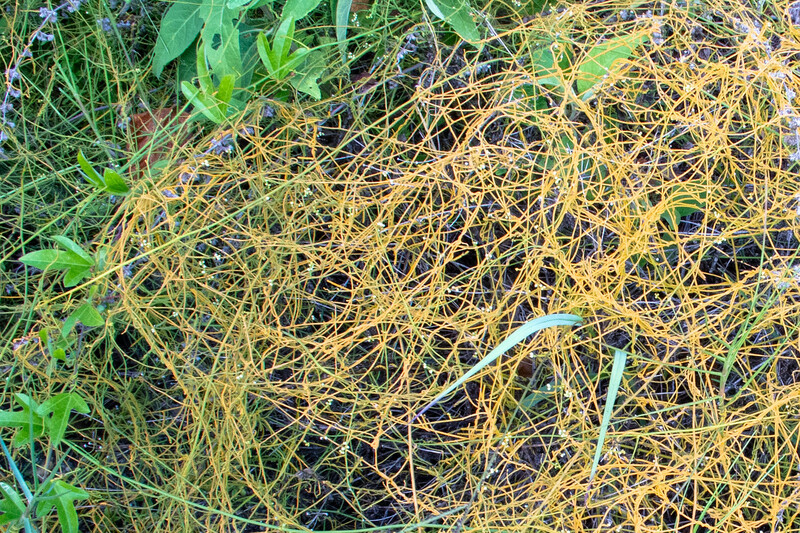 One of the more interesting of the Yucatan plants is the parasitic Cuscuta vine also known as dodder. Dodder has naturally evolved what is known as haustoria that grow into a host plant’s vascular system robbing the host of nutrients. Because the dodder gets its energy from the host it no longer needs chlorophyll for photosynthesis which it lost along with its leaves. If however, as often happens, the parasite kills the host, the dodder too dies. Seems to me like a metaphor for how we are treating this tiny little speck of universe we call earth. I have just scratched the surface of what we saw during our hour or so walking meditation and only mentioned a few of the plants. There was also a huge assortment of birds and fish and insects. There was an embarrassment of butterflies. The sea was lined with shorebirds and shells. Fish frolicked in the surf and crabs scuttled in the shallow pools of low tide. We even saw a Gray Fox. Many of the things that we saw would have gone unnoticed were it not for the trained eye of Jim Conrad; a selfless man who simply wants to educate our species and create advocates for the planet. Advocates, it so desperately needs right now. Delightful visit with Jim! I’ve visited with him twice, in Pisto (at Hacienda Chichen, where he lives in a pilapa u2014 a house of sticks and thatch) and I also subscribe to Jim’s weekly email newsletter. I hope to see him again this winter when we return to Merida. ~eric.